Here is a simple adaptation of Marco Minerva’s previous example: Controlling a Gadgeteer device using Bluetooth Module and 32feet.NET library. This application uses the GHI Electronics Bluetooth Module to control the relays on a Seeed Relay Module. You can use this scenario to turn on lights, start a motor, or start or stop any electrical circuit within the Wattage limits of the relays, anywhere within range of a .NET Gadgeteer device with the Bluetooth and relay modules. When setting up the device in the Visual Studio Designer, do not include the Bluetooth module, because we are using Eduardo Velloso’s driver for the GHI Electronics Bluetooth Module. Download the driver from CodePlex and add the Bluetooth.cs file to your project. Connect the module to socket 9. The code is simple, just the initialization of the Bluetooth module and an event handler to process messages coming to the device from the application running the 32Feet library on your computer. I used a button to test the relays before starting them from the Bluetooth control; you want to be sure you have it right when a circuit is connected to 120 volts. I used relays 1 and 3, leaving two more to connect to other circuits. The control application is Marco’s application with a couple of names changed. 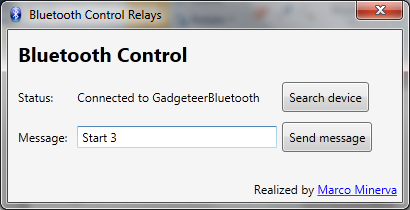 The code under the previous heading uses the name GadgeteerBluetooth to initialize the module: bluetooth.SetDeviceName(“GadgeteerBluetooth”), so to connect to the Bluetooth device from the client, you have to change a couple of things, then the following UI will work as expected. The client code I used is shown in the following MainWindow.xaml.cs file. The complete application is available at download. Use the BluetoothControl solution, and adapt it to the names used in this example. This entry was posted on May 7, 2012, 9:09 AM and is filed under Embedded Microcontrollers. You can follow any responses to this entry through RSS 2.0. You can leave a response, or trackback from your own site.